Hi everybody! This will be the last post in this year, so hope you all have a happy and healthy new year, and manage to make some of your dreams come true. We have had a lot of rain to end the year here, with the Rhine looking very swollen and lots of fields under water. I took these pics when I was out for a walk on Boxing Day. Today it stayed mostly dry, and the sun came out occasionally. I love the pictures of the evening sky in winter! 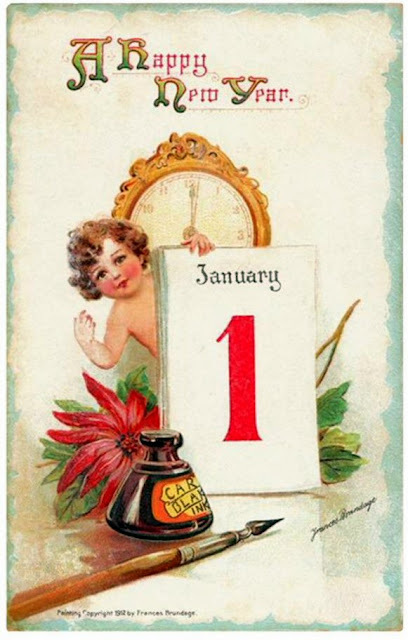 Enjoy your New Year celebrations, have fun, but take care! Thanks for visiting and for your support all year! I am linking to Paint Party Friday, hosted as always by Eva and Kristin. Hope you all have a good weekend. Take care, and thanks for visiting! Hi you all, hope you have been enjoying a wonderful Christmas up till now! Here it is wet and (almost) warm, we have had temperatures of over 50, and in the south of Germany it was even more. The snow has gone, and today we even had a rainbow - the first time I have seen one at Christmas! The tags are from a swap organized over at Tag Tuesday. I would like to thank all who took part, Carolyn who organized it, and all the ladies who sent such gorgeous tags! I unfortunately do not know who made the wonderful bird. Thanks a lot, anyway! The lovely red Santa came from Anni in Denmark, thanks a lot! The beautiful snowflakes came from Barb. Thank you! The red doors open up here to show a gorgeous snowman, which I forgot to photograph! Thanks a lot, Martha, sorry I don't have a blog addy. The beautiful white lace tag, which has been hand stitched is from Elizabeth. Thanks a lot! Enjoy your holidays, take care, and thanks a lot for dropping in! Wishing you all happy and peaceful holidays and all the blessings of the Season! 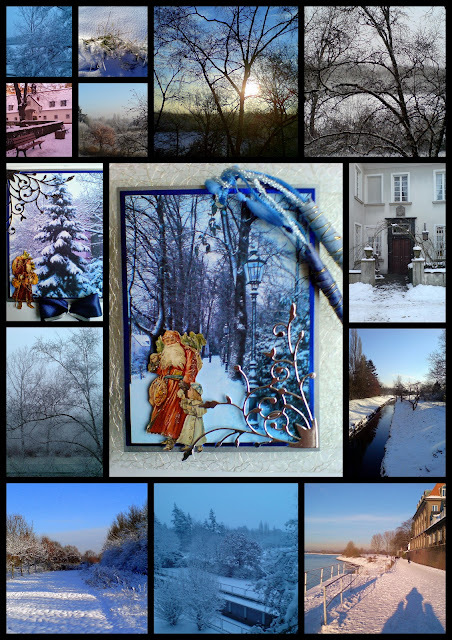 Here is a collage of some wintry photos taken in my little corner of the world. Take care, have fun, and thanks for visiting! Hi you all! it's time for another Paint Party Friday, hosted as always by Eva and Kristin. I have re-used an old canvas, which gave me the background texture. I was intending it to be something else, but after I had knocked a cup of coffee over it, I decided to utilize the drips. I have used different metallic paints, gold ink, and some Adirondack spray in plum. I added more texture with micro-beads sprinkled onto the wet paint. I had problems doing the letters, because of shaky hands and a gold Edding pen that was nearly empty and very scratchy, but will go over them when I have a new one, but on the whole I am satisfied with this painting. And it's my birthday today, Friday, December 21st. As I don't think that the Mayans were predicting the end of the world for today, I have baked a chocolate cake with lots of frosting. I'm not expecting any visitors, but one of the advantages of being alone is that you get to eat the cake all by yourself - of course, not all at once! Have a good weekend, take care, and thanks for dropping in! Hi you all! I have been busy doing next to nothing these past couple of days, but I did manage to alter a notebook for the *winter* challenge at Out of a Hat Creations, Not really exciting, but definitely wintry! The back and front are different, and I made a matching tag/ book-mark. At Tag Tuesday the theme this week is to alter a bauble or make an ornament, so I made some little, ornamental tags which could be hung on a tree if I had one! Very original, too - sorry, but I think I have run out of Christmas ideas! And a Gingerbread man, who caught a cold after coming out of the oven! Have a good day, take care, and thanks for coming by! Hi you all! It's still very frosty, snowy and icy here, and I am hoping for the warmer weather we have been promised in the next days. While browsing in one of my old 'German Housewives' magazines from 1900 I saw these lovely images of skaters, and the lady dressed in her winter finery. Please feel free to download and copy the images if you would like to! Have a good day, keep warm, and thanks for looking in! Hi you all! Here is my tag for 'Deck the Halls' for Tag Tuesday. I found some Graphics 45 paper in my stash with carols on it, so used it for the background. The lovely window cut-out was sent me by a friend, as was the lantern, holly wreath and bow - just in time for this piece! I put a Christmas tree 'inside' the window, so it looks like you are looking in. The challenge at 'out of a hat' creations this week is to make a shrine. I have used a little tin which was once filled with delicious, mini Lindt chocolates. I did not paint the tin, as I thought it was too pretty to alter. I lined the inside with lace and some beaded flower trim, and added photos of my Mum and me as babies, some flowers and a butterfly. My Mum used to love yellow and lilac flowers, so I have used them here. I decorated the lid with some butterflies and a metal flower which used to be on a brooch of my Mum's. I used some old, lace hankies of my Mum's as a background. I am still very slow at crafting on account of my shaky fingers, but I am hopeful that sooner or later I will be able to craft without dropping everything I pick up at least 5 times! Hi everybody! I have been working on my wired angel on and off for the past few days. As I can't do fine things just now because of my shaky fingers, I decided I needed to do something with hammer and tongs and glue-gun, and I did. I started off with a papp-maché torso, which I covered with scraps of tissue paper. This step was really a waste of time, because you can't see any of it now, but I just enjoyed tearing the bits of tissue and slapping them on with golden gel, and getting nice and sticky once again. After it had dried, I used my fingers to smear coarse structure paste all over it, which was a bit hard on the fingers as it is rather scratchy. Then I put it by the radiator overnight to dry. In the meantime, I put on my thick workman's gloves, and started scrunching a piece of chicken wire into a pair of wings, and bound the middle with some wire. By this time I was determined to give her a hat, which had been made from aluminium-foil, moulded over a tennis ball, and then covered with soft wire mesh, and given a rolled up brim. The hat was made for another angel -who has disappeared! -some time back, but I was sure it would suit this angel just as well. BUT - she needed a neck to support the hat! This time I took a loo-roll, cut it a bit shorter, and snipped into one end about every half an inch so it would fit over the neck. I covered it with some embossed paper and painted it white, and then fixed it over the neck of the torso, using some smooth plaster, and holding it down till it had dried. Then I covered the join with coarse structure paste. When it was all nicely dry, I glittered her with Ice Stickles in blue and silver, and she glitters beautifully. After she had had another night by the radiator to dry off, I got to work with the heat gun. I only got one blister this time! First I fixed her wings in place, then her belt - a scrap of wire mesh - and finally her hat, which put up a lot of resistance and did not want to be stuck onto a loo-roll neck. But I won in the end, and here she is in all her glory. And then the birds started making a fuss because they wanted to be on a picture, too! I'm still looking for a name for her. Any suggestions? Thanks for looking, have fun, and take good care of yourselves!